Get Your Trees Off to A Great Start! When should you feed your trees? 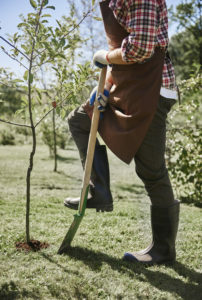 For planting new trees, use a root stimulant such as Bonide’s Plant Starter or Espoma’s Bio-tone. Both are light and easy feed for new trees and help promote early strong root development. Plant Starter is mixed with water and poured at the base of the tree. Bio-tone is added to the soil when backfilling around the tree. For trees planted 1-2 years, we recommend using a water soluble fertilizer such as Bonide’s Plant Starter or Miracle Gro, pouring the mixture around the base of the tree. The Ross Root Feeder is another option for water-soluble fertilizing. It’s a unique tool (attaches to your garden hose) which injects the water-soluble fertilizer right into the soil, as well as helping in light soil aeration. Also, this can be used as a watering tool without adding the fertilizer! Fertilizing your lawn regularly with a lawn food helps to feed your existing trees. Ross Root Feeders are an easy way to feed larger trees injecting a water-soluble fertilizer into the soil/root zone, as well as watering the tree and lightly aerating the soil. This is the same process many professional tree care companies will use to feed established and mature trees. Again, this tool is also an excellent way to water trees during periods of drought! Vertical mulching is an excellent way to not only core aerate the soil around trees, but it can also be used to feed the trees. Vertical mulching is the process of drilling a series of 2-inch diameter holes approximately 8 to 12 inches into the ground. These holes are drilled about 18-24 inches apart in a circular pattern, starting 6 feet or so away from the tree’s trunk, working your way out (circular pattern) to several feet past the drip line of the tree. These holes can be left open or backfilled with coarse products like sand, pea gravel, turface, or compost, followed by a good watering. This process opens up the soil around the tree for better airflow, better water absorption into the soil/root zone, and creating better areas for tree roots to grow. Vertical mulching can be used as a means of fertilizing the tree by adding a granular fertilizer to the backfill used to fill the open cores drilled around the tree. This also is an opportunity to apply soil amendments such as soil sulfur and Ironite for chlorotic trees. Although this is an excellent way to feed trees, and helps improve the flow of air and water into the soil, it is time and labor intensive, and maybe one to consider having a professional tree care company do for you! If using Espoma’s Tree-tone, Plant-tone, or Milorganite, read the label for amounts needed for each tree. Then distribute the amount evenly into all the cored holes. If using a fertilizer such as 10-10-10, look for a tree feeding rate on the bag. If nothing is available, then calculate using 1 pound per inch diameter, for tree trunks 1-6 inches in diameter. For those tree trunks 6 inches diameter or larger, use 3 pounds per inch diameter. Once finished, be sure to water the trees with good soil soaking. Fertilizer spikes driven into the ground around the tree is another ‘easy’ feeding option, although not one of our favorites. Calculate how many spikes are needed per tree, break those spikes in half, and evenly distribute them around the tree. Be sure they go 6-8 inches down into the ground, to feed tree roots more than feeding the grass. Water in after putting them in the ground.